Animal husbandry must always be taken VERY seriously. Many small exotic creatures have quite simple culture requirements, and it is easy to provide suitable habitats to meet their needs. If you can (1) buy pets from ethical sources, (2) provide a suitable environment with correct culture conditions, (3) only obtain the quantity of pets that you can properly take care of and (4) ensure that no pets escape into habitats in which they do not belong, then looking after weird and wonderful pets, and showing their life cycles and natural history stories to the next generation is an incredible way to inspire young minds and help nuture budding naturalists, scientists and conservationists. PLEASE WATCH THIS VIDEO AND THINK ABOUT THE REQUIREMENTS OF ALL PETS BEFORE CONSIDERING OBTAINING ANY LIVE ANIMALS. 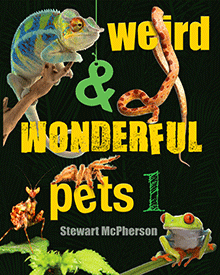 You can pre-order your copy of Weird & Wonderful Pets at a bargain price now! Redfern Natural History Productions Ltd.